• Low power consumption, high performance. The world's first highly integrated ultra-low energy wireless Wi-Fi IP Camera SoC that reduces power consumption by 30~50%. Captures the first image in 0.15 seconds, takes 0.5 seconds to power on and 1 second to connect to the Internet. • Miniaturized and highly integrated; it integrated MCU, Dualband Wi-Fi, ISP, H.264 Video Encoder, Audio codec and Memory on a single chip. • Easy to develop and fast implementation. Complete HDK/SDK is provided which integrated diverse IoT protocols and world-renowned cloud platforms, allowing customers to use the shortest R&D time for quick product implementation and make it available to the market. Realtek's RTL8715A is the world's first ultra-low-power, highly integrated wireless network camera SoC. 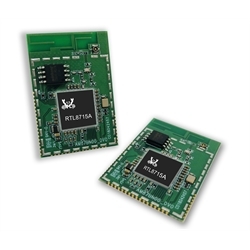 The RTL8715A integrates H264 Encoder/ISP/Wi-Fi/Audio Codec/PMU functions in a small size single chip. It features ultra-low power consumption, smallest size, fast system boot up, advanced Trust-zone, and Secure boot system security, which is ideal for small-form-factor Wi-Fi network camera and battery-powered camera applications. The RTL8715A enables product fast time to market with minimal R&D efforts.